In the end, only the mad will survive in the post-apocalyptic action-thriller Mad Max: Fury Road, the fourth film in the franchise’s epic history. As the movie opens, Mad Max (Tom Hardy, The Drop), haunted by his turbulent past, believes the best way to survive is to wander alone. 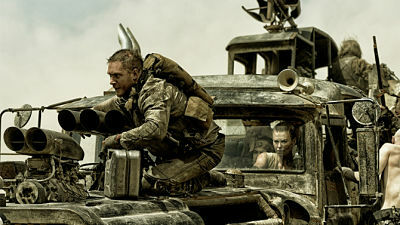 Nevertheless, he becomes swept up with a group fleeing across the Wasteland in a War Rig driven by an elite Imperator, Furiosa (Charlize Theron, Young Adult). They are escaping a Citadel tyrannized by the Immortan Joe (Hugh Keays-Byrne, Sleeping Beauty), from whom something irreplaceable has been taken. Enraged, the Warlord marshals all his gangs and pursues the rebels ruthlessly in the high-octane Road War that follows. Directed by George Miller, who helmed the franchise’s three previous installments, the film also stars Nicholas Hoult (X-Men: Days of Future Past), Nathan Jones (Conan the Barbarian), Zoë Kravitz (Divergent) and Rosie Huntington-Whiteley (Transformers: Dark of the Moon). Also available on September 1 will be the Mad Max 4-Film Blu-ray Anthology. The anthology includes Mad Max (1979), The Road Warrior (1981), Mad Max Beyond Thunderdome (1985) and Mad Max: Fury Road on Blu-ray disc. The anthology also includes the documentary Madness of Max on DVD along with Mad Max Anthology trading cards and will be available for $89.98.